Tired? Headaches? Susceptible to infections? Ferritin CHECK is a rapid test for the identification of iron deficiency at home or at a point of care. 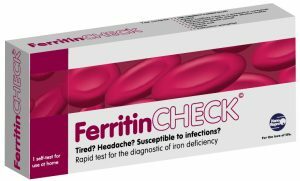 FerritinCHECK measures the iron containing protein Ferritin which is the primary form of iron stored within cells. The amount of Ferritin released within the blood is a reflection of the bodies iron level. Iron deficiency can be caused by insufficient dietary intake and absorption of iron, or iron loss from bleeding (for example, menstrual bleeding, abnormal bleeding or ulcers), also during pregnancy or growth phase, and has serious health consequences. FerritinCHECK is intended for use an an indicator. The final diagnosis must be confirmed by a physician. Each kit contains everything necessary to perform the test: a test cassette, an instruction leaflet, a solution bottle with sample dilution buffer, 1 automatic sterile lancet for comfortable blood sampling, a glass capillary tube, a pipette, an alcohol pad and a plaster. The results can be read within 10 minutes. Iron deficiency prevalence is highest among young children and women of childbearing age. It is important that current body iron stores are sufficient. Ferritin in the human blood serum is a laboratory marker of the total amount of iron stored in the body. Fatigue, headache, pallor, strong heartbeats or shortness of breath are all possible indications of an iron deficiency.